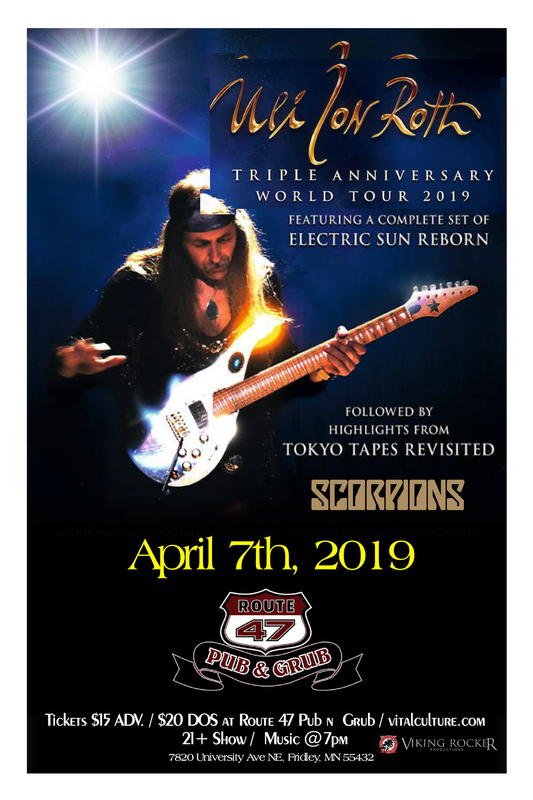 THE SCORPIONS’ ORIGINAL GUITARIST ULI JON ROTH TRIPLE ANNIVERSARY WORLD TOUR IS COMING TO Route 47 Pub & Grub! Uli Jon Roth for his 2019 North American Tour redux. It will be an evening with, a very special 3 hour show. It will be a full set of Electric Sun, with a short intermission, and then a full set of SCORPIONS. It will be the first time he has done a full Electric Sun show in the US in over 30 years, and the US was a very strong market for them. Tickets are just $15 in advance for GA, and $30 for VIP!